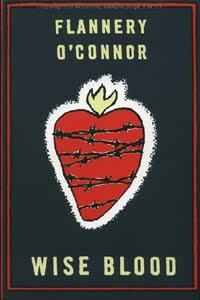 Wise Blood (1952) was the first novel by Flannery O’Connor (1925 – 1964), who in her short life became one of the exemplars of America’s Southern Gothic tradition and one of the country’s great writers of the 20th Century. Basically, she was a true original, which, as is usually the case, makes her stuff bizarre. Wise Blood has plenty of incident but not much plot. O’Connor stapled it together using some stories she already had kicking around. She didn’t do a bad job integrating them but it does make any attempt at recapping the plot a pain. Hazel Motes wanders about, trying to abandon his belief in Jesus. “I AM clean,” he said again, without any expression on his face or in his voice, just looking at the woman as if he were looking at a wall. “If Jesus existed, I wouldn’t be clean…” He meets “blind” preacher Asa Hawks and his daughter Sabbath. He decides to seduce Sabbath; she gets the same idea about him. He founds the Church Without Christ and buys the ultimate beater car to preach it from. “I’m going to preach there was no Fall because there was nothing to fall from and no Redemption because there was no Fall and no Judgment because there wasn’t the first two.” He is pursued by a weird kid named Enoch Emery who is also struggling against God’s interference. Then he meets his own doppelgänger and feels called upon to action. “Two things I can’t stand,” Haze said, “- a man that ain’t true and one that mocks what is. You shouldn’t ever have tampered with me if you didn’t want what you got.” Things get ominous from there. Southern Gothic is one genre where you’re allowed to jump the shark – straight away if you like. One of the chief differences between O’Connor and, say, Carson McCullers is that O’Connor doles it out in a reasonable manner. In The Ballad of the Sad Cafe McCullers holds nothing back – the main characters are introduced feet-first as a giantess, a hunchbacked dwarf and the giantess’ demonic ex-husband. O’Connor introduces each player in the drama of Hazel Motes as just a little bit odd, getting you used to them as people before their inner grotesquerie is revealed. Her landscape thus seems the wider and more pervasive of the two, though she also lacks McCullers’ sympathy for losers and misfits. O’Connor’s tone is entirely mocking. As such, her novel is off-balance. In dealing with the macabre and divine, you’d anticipate something very serious. You’d be right…and wrong. “It is a comic novel about a Christian malgre lui, and as such, very serious, for all comic novels that are any good must be about matters of life and death,” said the author. She instructed the book to be read with “zest,” as it was written. Since humour is subjective it’s hard to critique on this level. It’s like Kafka – some people find him hilarious, others just get freaked out. I certainly enjoyed Wise Blood but was not often amused (recounting some of its scenes to my mother had her laughing out loud with me vaguely puzzled as to why). “What you do?” she asked. She was a tall bony woman, resembling the mop she carried upside-down. He said he was a preacher. The woman looked at him thoroughly and then she looked behind him at his car. “What church?” she asked. He said the Church Without Christ. He said no mam, it was Protestant. 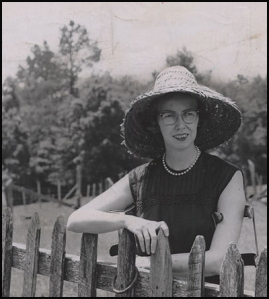 Flannery O’Connor was devoutly Catholic, which flavours all her writings but in a rather unusual way. She lived all her life in the Bible Belt and Wise Blood’s main cast are all nominally Protestant (though most are more truly myopic hucksters and inarticulate existentialists). Think of Catholicism in literature and you’ll probably picture guilt (lapsed or otherwise), adultery and miserable Irish boyhoods. Wise Blood doesn’t ascribe to any of that; it pokes fun when a lapsed Catholic does appear. Rather, O’Connor’s South is so incompetent it can’t even hone a dignified sense of the end-times. Everything anyone does in the unfriendly, fallen city of Taulkinham is charged with absurdity, all plots are ramshackle, all disguises are paper-thin, crimes go unnoticed and the police are calmly brutal about it all. These people are treated as blind. Everyone in the novel is pretty much a jerk and some are charlatans on top of that. Enoch Emery misses no opportunity to prod and insult the animals he comes across; Hazel’s landlady, Mrs. Flood, only wants money; Hazel himself seems to have no moral or fear-induced constraints on his behaviour. Only the slutty teenager Sabbath Hawks acts like she might be a good person at heart (nice irony for a book from the late 40s – early 50s). The final chapters strip the humour from the situation and fling the reader, through the viewpoint of the equally puzzled Mrs. Flood, into the alien landscape of martyrdom, where suffering is salvation and death is deliverance. Is it thus a happy ending? Does Hazel Motes receive divine grace? O’Connor doesn’t say; this isn’t a polemic. The novel’s moral compass is on the fritz but it is pointing somewhere. It’s just the reader’s job to figure out where that is. The light touch never abandons proceedings, even in the retribution that visits each of these sinners. Enoch Emery’s fate is brought to him courtesy of a man in a gorilla suit. Haze uses his car in a way that you might expect from a Cormac McCarthy novel and promptly loses said vehicle for not having a driver’s license. Mrs. Flood is punished by love. Of course, if suffering is taken as a revelation of divine will then this counts as mercy. And since it’s not much possible to actually care about any of these people, the theory doesn’t come across as offensive but successfully thought-provoking. Wise Blood is a comic novel with a grim finale and a tragedy with a happy ending. Just try to wrap your brain around that one! I shall of course be reading all the rest of her work.